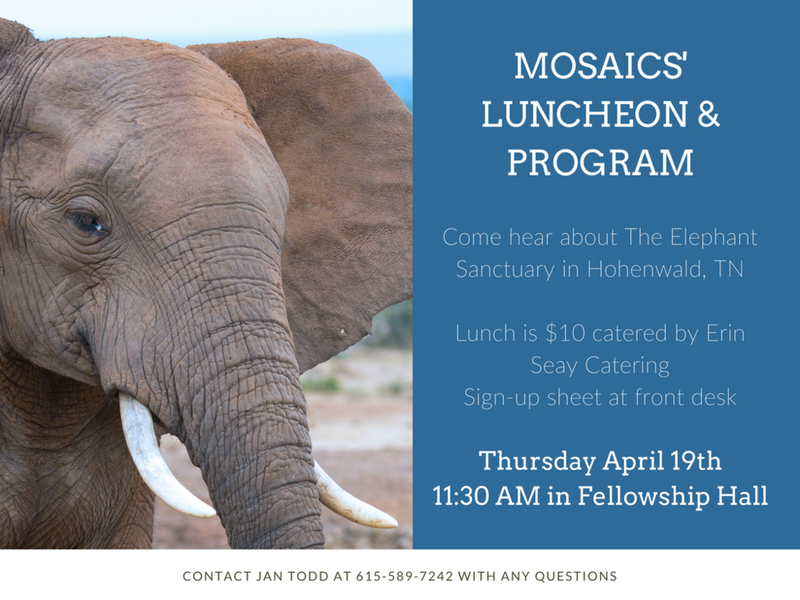 The Mosaics have a wonderful program coming up on The Elephant Sanctuary, located in Howenwald, TN. The Sanctuary is currently home to 10 elephants retired from zoos and circuses, many of whom suffer long-term health and behavioral issues common to elephants that have spent their lives in captivity. The Sanctuary employs a fully integrated team of veterinarians and caregivers who provide high-quality care by using positive reinforcement and protected contact to safely meet the needs of each elephant in our care. The program will be in the Fellowship Hall with a catered lunch by Erin Seay. Cost: $10. Please sign up at the front desk and contact Jan Todd at 615.589.7242 with any questions.